The sense of touch is utilized in the system of reading for the blind known as Braille. Touch (or tangoreception) is the physiological sense by which animals perceive an object in their environment when it comes into contact with the body surface. Touch is one of a variety of closely associated mechanisms or faculties (collectively known as the senses) by which a living organism receives information about its external or internal environment. There are two main types of sensory receptors related to touch: tactile hairs and subcutaneous receptors (receptors below the skin’s surface). Many animals, ranging from insects and other arthropods to birds and mammals, possess hairs or hairlike projections richly supplied with nerves. 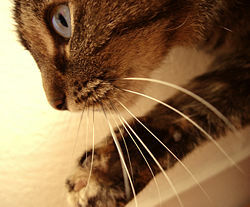 Some hairs, such as whiskers (or vibrissae), may be specially adapted in certain areas of the body to provide more sensitive tactile sensation. Sensory receptors below the skin are a second means of perceiving touch, which is a type of mechanoreception, or sensitivity to mechanical stimuli. Like other sensory cells, the mechanosensors associated with touch convert physical stimuli into signals that are transmitted to specific areas of the central nervous system (i.e., the spinal cord and brain) for processing and interpretation. These stimuli create a temporary physical distortion in the membranes of specialized receptors, causing ion channels to open and ultimately generating action potentials, which are the messages of the nervous system. Density of tactile sensors varies across the body, but tends to be particularly concentrated in organs of touch, such as an octopus's tentacles, a pig's snout, or the fingertips of a human hand. Along with the senses of taste, smell, sight, and hearing, touch is an example of exteroreception, which gives organisms complex feedback about their external environment. Touch allows organisms to obtain, with a degree of precision, points of tactile stimuli at the body's surface. 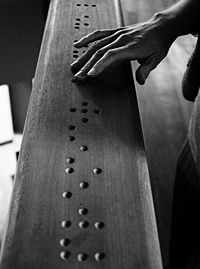 This tactile perception is behind the system of Braille, for example, which draws on the sensitivity of the fingertips to enable the blind to read raised type. Other features of the animal often work in conjunction with touch receptors to enhance proprioception—external feedback that helps the organism to understand its spatial position. The sense of touch is very closely connected to other sensations received by the skin, including the perception of pressure (e.g., shape, softness, texture, vibration, etc. ), relative temperature, and sometimes pain. These senses are collectively known as the somatosensory system. Touch is a fundamental sense that adds immensely to the quality of human life. It is the sense that allows someone to feel the embrace of a loved one and to feel the texture of a peach. It allows one to grip a baseball to throw and to feel the ocean waves. Without the sense of touch, one would not experience their feet hitting the floor, the wind as they walk outside, the coffee mug from which they drink, and even turning the pages of a book would become difficult. This sense helps people to relate to others, often evoking powerful emotions, and enhances the joy that people experience from interacting with nature. Objects touching an organism's skin generate diverse sensations because the skin is packed with a variety of specialized mechanosensors. Expanded-tip tactile sensors are also located in these outer regions. They differ from Meissner’s corpuscles in that they adapt only partly and slowly. Instead, they are useful for providing steady-state information about objects that touch the skin over long periods. Pacinian corpuscles sense pressure. Located deep in skin, they are made up of concentric layers of connective tissue that encapsulate an extension of a sensory neuron. These mechanosensors respond especially well to vibrations applied to the skin, but they also adapt rapidly to steady pressure. Other receptors include Krause’s end bulb, which senses touch, and Ruffini’s corpuscle, which senses touch and pressure. The latter is a spindle-shaped receptor sensitive to skin stretch; it contributes to the kinesthetic sense and control of finger position and movement. Most sensory cells are modified neurons. Sensors are specialized for particular types of stimuli—for example, chemical, mechanical, and light. Mechanosensors are specialized cells that are sensitive to mechanical forces. The sensor possesses a membrane protein that detects the stimulus and physically distorts the mechanosensor's plasma membrane. The sensor responds by altering the flow of ions across the cell membrane. The resulting change in membrane potential causes the sensor to fire action potentials, the universal message system of the nervous system. The intensity of the stimulus is coded as the frequency of action potentials. Although the message is coded in the same form regardless of the stimulus, organisms perceive different sensations because messages from sensors arrive at different places in the central nervous system (CNS). The primary area for the perception of touch in the human cortex is located in the postcentral gyrus. The parietal lobe contains the primary somatosensory cortex, the main sensory receptive area for the sense of touch. Areas of this part of the mammalian brain map to certain areas of the body, depending on the amount or importance of somatosensory input from that area. For example, a large area of the cortex is devoted to sensation in the hands, which are rich in sensory receptors, while the back receives a much smaller area. Tactile hairs are an example of mechanosensors that are not neurons. From one surface, they have projections called stereocilia, which, when bent, alter receptor proteins in the hair cell's plasma membrane. When they are bent in one direction, the receptor potential becomes more positive. When this happens, the hair cell releases a neurotransmitter to the sensory neurons associated with it, and these neurons in turn send action potentials to the brain. A house cat's prominent whiskers are specialized hairs that are usually employed for tactile sensation. As mentioned above, the sense of touch allows many vertebrates and invertebrates to localize precisely points of tactile stimulation in contact with the body's surface. The long antennae of many arthropods (e.g., crayfish) and the lengthened tactile hairs (vibrissae) on the snouts of nocturnally active mammals (such as cats and rats) enhance the sense of touch by enabling them to perceive objects in their immediate surroundings. The sense of touch also functions in aspects of proprioception such as orientation and equilibrium. For example, sensory contact with the ground often gives terrestrial animals information about their spatial position. Many invertebrates have organs (known as statocysts) that use hair cells to signal the position of the animal with respect to gravity (equilibrium). The mammalian inner ear also includes two organs of equilibrium that use hair cells to detect the body's position. Tactile hairs are found in the lateral line sensory system of fishes, a canal under the surface of the skin that provides information about the fish's movements through the water and about moving objects that cause pressure waves in the surrounding water. Haptic, from the Greek αφή (Haphe), means pertaining to the sense of tactition (touch). Haptic technology refers to technology that interfaces with the user via the sense of touch by applying forces, vibrations, and/or motions. This mechanical stimulation is used to create haptic virtual objects. Haptic technology has made it possible to investigate in detail how the human sense of touch works by allowing the creation of carefully-controlled haptic virtual objects. These objects are used to systematically probe human haptic capabilities, contributing to our understanding of how touch and its underlying brain functions work. Flanagan, J. R. and S. J. Lederman. 2001. Neurobiology: Feeling bumps and holes Nature 412(6845): 389-391. Hayward, V., O. R. Astley, M. Cruz-Hernandez, D. Grant, and G. Robles-De-La-Torre. 2004. Haptic interfaces and devices Sensor Review 24(1): 16-29. Purves, W., D. Sadava, G. Orians, and C. Heller. 2004. Life: The Science of Biology, 7th edition. Sunderland, MA: Sinauer. ISBN 0716766728. Robles-De-La-Torre, G. and V. Hayward. 2001. Force can overcome object geometry in the perception of shape through active touch Nature 412(6845): 445-448. Robles-De-La-Torre, G. 2006. The importance of the sense of touch in virtual and real environments IEEE Multimedia 13(3): 24-30. This page was last modified on 2 April 2008, at 17:56.